The memorial in Portdown to UVF men Wesley Sommerville and Harris Boyle. Any community is entitled to remember those who died as a result of the conflict in Northern Ireland “free from abuse,” Billy Hutchinson has said. The Progressive Unionist leader was commenting after a party representative was targeted for publicising a UVF commemoration in Portadown last weekend. The memorial to UVF men Wesley Sommerville and Harris Boyle. Party secretary and former election candidate Helen Smyth shared a message on Twitter saying the “sacrifice” of to two paramilitaries, killed by their own bomb, was being “remembered with pride”. Harris Boyle and Wesley Somerville were members of a gang that flagged down a minibus being used by the Miami Showband as they drove to Dublin from Banbridge in July 1975. A device being loaded on to the vehicle exploded prematurely. The surviving members of the gang then began shooting, murdering singer Fran O’Toole, guitarist Tony Geraghty and trumpet player Brian McCoy. Saturday’s parade in the Killycomaine area of the town included the laying of wreaths at a recently constructed memorial wall at the corner of Princess Way and Gloucester Avenue. The wall includes a UVF declaration and a plaque honouring the to men as “killed in action”. 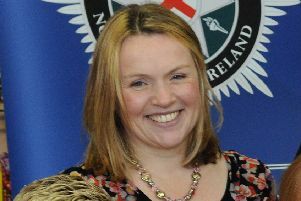 Mr Hutchinson described the abuse directed at Ms Smyth as “vicious, absolutely abhorrent and motivated by blind hatred”. A speaker addressing the crowd said that events such as the Miami Showband deaths had been consigned to the past and that it was time to look to the future. The previous day, one of the surviving band members remembered his murdered friends on the 40th anniversary of the atrocity. Singer Des McAlea (stage name Des Lee) laid flowers at the scene in Buskhill then, on Sunday, along with fellow survivors Ray Millar and Stephen Travers, he took part in a public service attended by a small number of friends and family.